An essential item for the instrument builder, The Luthier's Handbook explores the secrets and science behind making good-sounding acoustic stringed instruments. 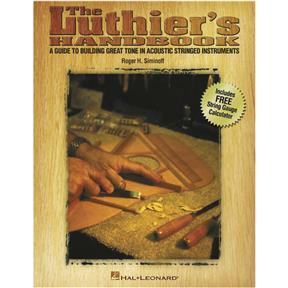 Renowned author Roger H. Siminoff brings to the table more than four decades of luthiery experience and shares the time-tested philosophies, tips and technology of the craft. As the ideal complement to other books on building instruments, this text describes the structural and acoustical attributes of air chambers; what to listen for when tap-tuning; selecting a good piece of wood; placement of the braces and tone bars and how to tune them; how to select the right strings; what to consider in bridge design concepts; and much more. Includes a free String Gauge Calculator for determining the right set of strings.